The Intercity Baseball Tournament is in its 85th edition, and 34 corporate teams from around the country are participating in the event being held at the Tokyo Dome. 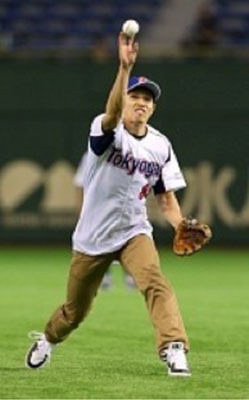 Following Kimura’s throw, the first game was played between Tokyo Gas and Sendai-based 77 Bank (Shichiju-Shichi Ginko) with Tokyo Gas won 6-1. Kimura carried the flag for Japan at the 2012 Summer Paralympics opening ceremonies in London, and then went on to win a silver in the men’s 100 metre breaststroke SB11 race and a bronze in the men’s 100 metre butterfly S11 event. More recently, at last year’s IPC Swimming World Championships, he won a gold medal in the men’s 100 meter freestyle S11 race and a bronze medal in the men’s 200 meter individual medley SM11 event.